de Castell’s debut novel, Traitor’s Blade, was released by Jo Fletcher Books July 15th. You can read an excerpt of the book at Scribd. SF Signal: Hello, and thank-you very much for taking the time to answer some questions for us about your debut novel, Traitor’s Blade. Sebastien de Castell: My pleasure – thanks for having me! SF Signal: In previous interviews, you’ve described Traitor’s Blade as “The Three Musketeers meets A Game of Thrones,” so clearly, you have great taste in reading material. What other books and authors inspired Traitor’s Blade? Did I detect a bit of David Eddings’ influence in your characters’ banter? SdC: You know, I never thought about David Eddings before you mentioned him but actually I really enjoyed reading the Belgariad series when I was younger. He really mastered that sense of a character’s internal conflict and desire to push back against the expectations others have of them. You’re right as well that his characters often banter with each other. In the case of Traitor’s Blade, though, the banter is more informed by my own family’s tendency to want to one-up each other in conversation. Aaron Sorkin (of West Wing fame) is also a big influence for me when it comes to rapid-fire dialogue. In terms of other books, though I write fantasy, I find the stylings of noir writers like Raymond Chandler and, more recently, Dennis LeHaine have an amazing ability to create a sense of place with minimal info-dumping or description. SF Signal: Do you remember where your love of genre fiction first began? SdC: When I was a child my older sister read to my brother and I from The Lion, The Witch & The Wardrobe. That book changed the way I saw the world – suddenly large rocks became the stone table and every house cat was a possible Aslan. That’s the amazing thing about fantasy – not it’s escapist function but rather the way it can help re-enchant the world around us. SF Signal: Your dust jacket bio includes a fairly impressive list of professions, including musician, ombudsman, interaction designer, fight choreographer, teacher, project manager, actor, product strategist, and four hours as an archaeologist. How has your diverse professional background influenced your writing? SdC: Music gives one a sense of pacing that’s been helpful for me in writing – songs don’t get to be even seconds longer than they need to be and it’s all about creating emotional crescendos. That thought helps me focus on dramatic impact rather than world-building and exposition. Mostly, though, working in lots of professions gives you access to lots of different types of people and it makes you realize that none of us see the whole picture – we just see our little slice of the world and then think it represents the whole. That’s one of the reasons why when writing Traitor’s Blade it was important to me that Falcio, Kest, and Brasti, don’t know everything that’s going on. They’re struggling to unwind the conspiracy but they never get to know every detail of what’s happening around them. To me, that’s a more compelling and realistic mode than having every character somehow know everything that’s going on. SF Signal: How has the experience of writing stacked up to your other jobs? SdC: I don’t think there’s anything that I’ve ever done that’s quite as personally satisfying as finishing a novel. I’ve had the experience several times and every time it feels new and important and transformative. On the other hand, it can really get you stuck in your head so I’m glad I get to balance writing with performing as a musician and teaching in various fields – you need to find other creative outlets just to keep from becoming too glued to the computer screen. As a reader, I’ve always thought that a book’s battle sequences make or break a story. I was very pleased to discover that, although magic plays a part in the world of Traitor’s Blade, the story’s fight scenes feel very authentic. Did that authenticity arise as the result of your experience as a fight choreographer? Choreographing fight scenes did influence the way I write them but not quite in the way one might expect. The first thing I learned doing it for the theatre was that every fight has to be a complete story in and of itself – with a beginning, a middle, and an end. There has to be a conflict that’s distinct from the actual violence – a contest of wills or clash of ideals that exists independent of the weapons and blows. My experience also taught me how important it is to make every fight unique – you don’t want to just see the same kind of fight repeated several times in a book. Falcio’s a fun character to write in that sense because he thinks through every fight and obsesses over how to win given the unique circumstances he finds himself in. SF Signal: Has the experience of writing your own series effected how you experience other authors’ work? Do you ever find yourself critiquing other fantasy authors as you read their books or stopping to kick yourself for not including some plot element in your own story? SdC: I’m not sure, but I think writing has made me a worse reader. I do tend to analyze what I’m reading and that can inhibit my ability to get immersed in a new book. That being said, it gives me a huge appreciation for those books that do captivate me. SF Signal: How many more books can we expect in the Greatcoats series, and when can we expect to see the next volume hit shelves? SdC: There are four books in the Greatcoats series. The second book, tentatively entitled Greatcoat’s Lament, is with the publishers now going through copyediting. It’s due to come out in March though the German publisher is actually planning on translating and releasing this September – a full six months before it comes out in English. SF Signal: Are you allowed to tell us anything about what adventures await our intrepid heroes in the next installment of the series? SdC: Greatcoat’s Lament takes our heroes on a darker and more perilous journey than they’ve faced before. Falcio will come to question his idealized memories of King Paelis, Kest will pay the price that comes with wanting to be the greatest swordsman in the world, and Brasti will discover he can no longer get away with simply playing the charming rogue. Valiana, Aline, and the Tailor all take more central roles in the second book than they did in the first, and the clash between their different visions of right and wrong will shake Tristia’s very foundations. When I wrote Traitor’s Blade I wanted to make sure it was a complete story in and of itself rather than feel like it ended on a cliffhanger or just left huge plot threads hanging. I’ve worked very hard to do the same with Greatcoat’s Lament, so I very much hope that readers will enjoy it. SF Signal: Now that you’ve successfully published a book of your own, do you have any words of wisdom for all of the aspiring writers among our readers? SdC: Write the book you most want to read. Don’t worry about whether it seems fashionable or unique – just ask yourself what your favourite future book would be and then try to write it. That’s what I did with Traitor’s Blade. It turns out that when you write the story you most want to read there are other people who will love it, too. SF Signal: Finally, if you could “play” (write) in another author’s universe, which author and which series would you choose? 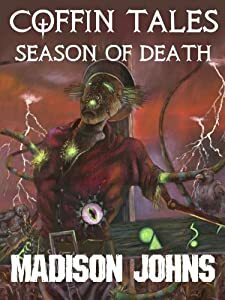 SdC: It’s going to sound like an odd choice, but I always thought there were more books that could have been written with Anne McCaffrey’s character Menolly and the Harper Hall trilogy. Dragonsong still stands as my favourite YA book of all time.